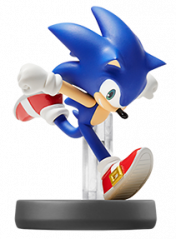 The Sonic the Hedgehog amiibo is part of Nintendo's series of toys-to-life figurines. It was introduced in the third wave of the Super Smash Bros. amiibo line. Like all amiibo, it can be used on the Wii U, Nintendo 3DS and Nintendo Switch consoles. Mario & Sonic at the Rio 2016 Olympic Games (Nintendo 3DS) 2016 3DS Tapping the Sonic amiibo powers up the Sonic Suit for 24 hours. Mario & Sonic at the Rio 2016 Olympic Games (Wii U) 2016 Wii U Tapping the Sonic amiibo allows you to enter the Sonic League with your Mii. Mario Kart 8 2014 Wii U From v4.0 onwards, tapping the Sonic amiibo will unlock a Sonic-themed racing suit for the player's Mii. Mario Kart 8 Deluxe 2017 Switch Tapping the Sonic amiibo will unlock a Sonic-themed racing suit for the player's Mii. Poochy & Yoshi's Woolly World 2017 3DS Tapping the Sonic amiibo will unlock a Sonic design for Yoshi. Super Mario Maker 2015 Wii U Sonic is an unlockable costume that can be used in the original Super Mario Bros. game style. He is unlocked either at random from clearing the 100-Mario Challenge on Expert or higher, or by tapping the Sonic amiibo. Sonic has his jumping sound effect, and the Game Over music and Act Clear music from Sonic the Hedgehog 3 are used. He otherwise plays exactly the same as Mario. Super Smash Bros. for Nintendo 3DS and Wii U 2014 3DS, Wii U You can bring your amiibo into the game as a powerful fighter that grows and evolves over time. Super Smash Bros. Ultimate 2018 Switch You can bring your amiibo into the game as a powerful fighter that grows and evolves over time. Yoshi's Woolly World 2015 Wii U Tapping the Sonic amiibo will unlock a Sonic design for Yoshi. The games listed here are those that usually have universal support for all kinds of amiibo including Sonic, generally to give the player a generic reward such as extra items. This page was last edited on 12 June 2018, at 17:32.